The Bureau of Labor Statistics (BLS) released the Producer Price Indexes (PPI) for May. Inflation in prices received by producers (prior to sales to consumers) fell 0.2% in May from April. This follows increases of 0.5% and 0.6% in March and April. On an unadjusted basis, prices were up 2.0% over the last 12 months. Among building materials, softwood lumber prices rose 1.0% in May from April. Prices are currently 28% above the average level over 2011, down from 38% above that level at the recent peak in April 2013. OSB prices have flattened out in 2014, declining 0.7% in May. Prices are currently 23% above the average level over 2011, down from 107% above that level at the recent peak in March 2013. Gypsum prices declined 0.7% in May. Prices are currently 41% above the average level over 2011, down from 49% above that level at the recent peak in February 2014. The Bureau of Labor Statistics (BLS) released the Producer Price Indexes (PPI) for April. Inflation in prices received by producers (prior to sales to consumers) rose 0.6% in April from March. This increase was dominated by increases in food goods and trade services. 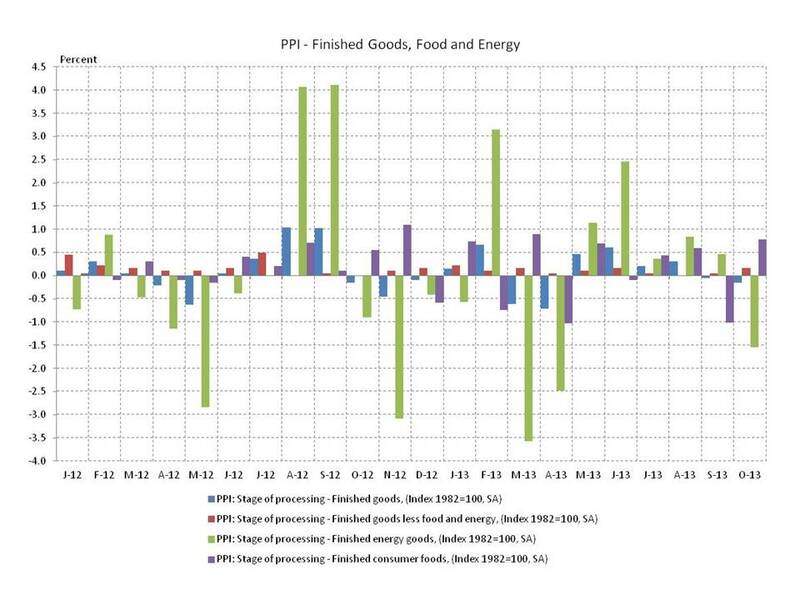 Excluding the more volatile, and weather affected categories of food, trade and energy, prices increased a more modest 0.3% in both March and April. Among building materials, softwood lumber prices are down 4.0% in April from March, and 8.2% from a peak one year ago. OSB prices continued to tread water so far in 2014, declining 0.6% in April, after a sharp 2013 reversal of the steep run-up in prices in 2012. OSB prices remain 23.8% above their average level in 2011. Gypsum prices declined 3.7% in April, the second monthly decline, but remain 41.9% above their average 2011 level. The Producer Price Index (PPI) – a broad measure of the prices received by domestic producers of goods and services – increased in March, according to data from the Bureau of Labor Statistics. The overall PPI increased 0.46% on a seasonally adjusted basis for the month of March, higher than analyst expectations. The PPI for goods was flat, with the increase in the headline PPI due to a month-over-month 0.65% for the PPI for services. On a non-seasonal adjusted basis, producer prices have increased 1.37% over the last 12 months, which while currently tame may suggest higher prices ahead. Among home building materials, gypsum prices were down 0.9% for the month of March, after significant increases in February (4.1%) and January (7.4%). Softwood lumber products increased 1.7% in March, while OSB prices were effectively flat. 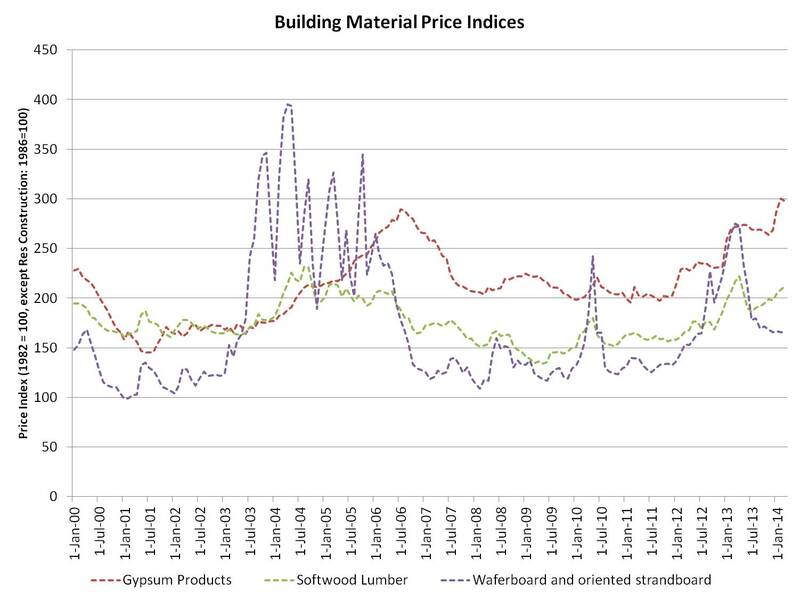 On a year-over-year basis, gypsum prices are up 9.5%, while softwood lumber prices are down slightly from a price peak set at the beginning of 2013. OSB prices are down nearly 40% from a significant run-up in price that began in 2012 but subsided at the end of 2013. 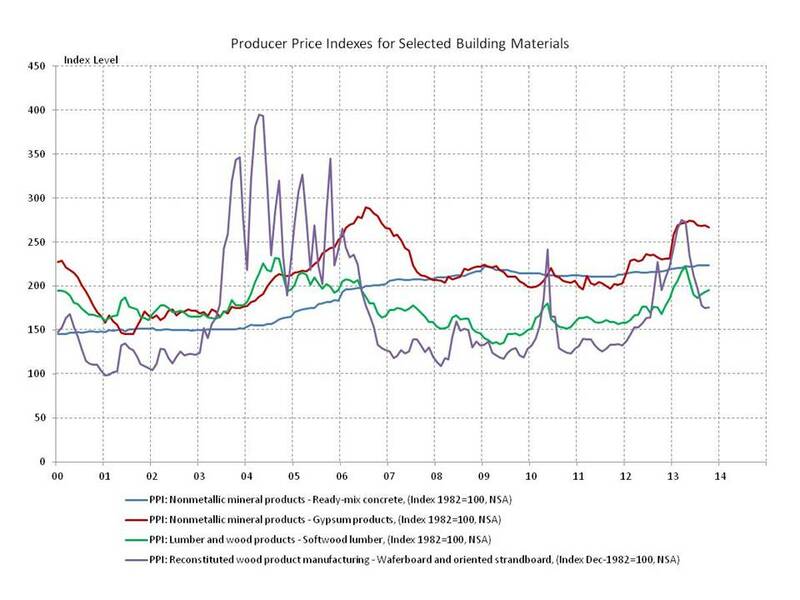 One conclusion that can be reached from recent years’ data is that the prices of major building materials tend toward volatility as home building expands. Rising and unpredictable building material prices represent yet another potential headwind along the overall path of recovery for the residential construction sector. The Bureau of Labor Statistics (BLS) released the Producer Price Indexes (PPI) for February. Overall, inflation at the producer level declined -0.1% in February from January (seasonally adjusted), balancing a 0.4% increase in prices for goods and a 0.3% decline in prices for services. On an unadjusted basis, inflation slowed to 0.9% for the 12 month period ending in February, from 1.2% in January. Among building materials, softwood lumber prices rose 2.2% in February from January, OSB prices declined 0.7%, and gypsum prices rose 4.1%. The Bureau of Labor Statistics (BLS) released major changes to the Producer Price Indexes (PPI) program with the data for January. The objective was to realign the aggregate indexes with the contours of a dynamic economy, incorporating indexes for services, construction, government purchases, and exports into the broader aggregate indexes. (For more information see new PPI.) The results show a little less core inflation (excluding food and energy) at the producer level, but the same pattern of prices driven by swings in energy prices over the last few years. Overall, inflation at the producer level maintained its modest pace, rising 0.2% in January from December, and 1.2% for the 12 month period ending in January. The PPIs for individual building materials were unaffected by the changes to the aggregate indexes. Softwood lumber prices moved up modestly in January after softening at the end of 2013. OSB prices firmed slightly after steep declines from early 2013 peaks. Gypsum prices jumped 7.4% in January from December, a significant down payment on the price increases some producers announced for the coming year. This increase brings gypsum prices to 99.5% of their housing boom peaks. The Bureau of Labor Statistics (BLS) released the Producer Price Indexes (PPI) for December. Producer prices for finished goods rose 0.4% in December on the strength of energy prices which rose 1.6% in December from November. Energy prices have been the main driver of overall prices in 2013. In December increases in energy and core prices (excluding food and energy) were partially offset by declines in food prices. Softwood lumber prices softened after increasing through the second half of 2013. OSB prices continued their descent, although at a slower pace than earlier in the year. Gypsum prices edged up in December finishing the year about where they started. Average gypsum prices in 2013 were 16.6% above 2012 levels, which were 14.1% above 2011 levels. 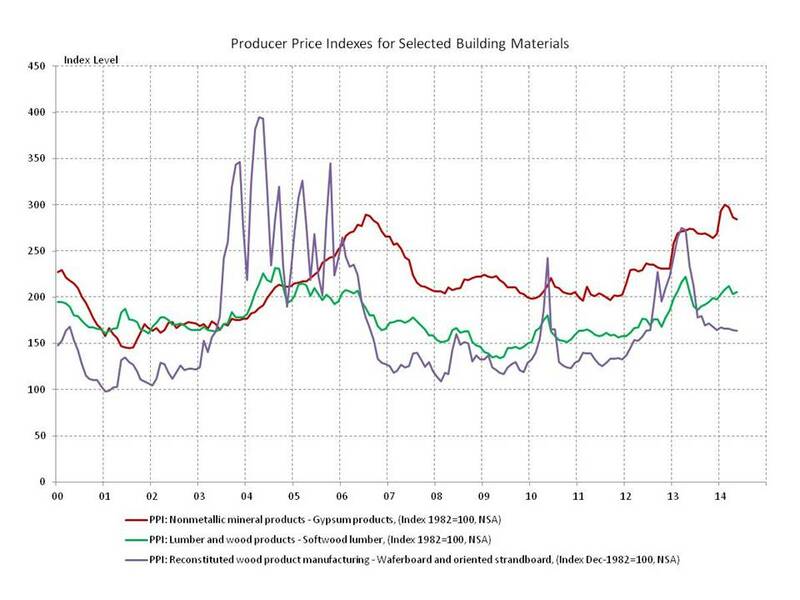 The Bureau of Labor Statistics (BLS) released the Producer Price Indexes (PPI) for October. 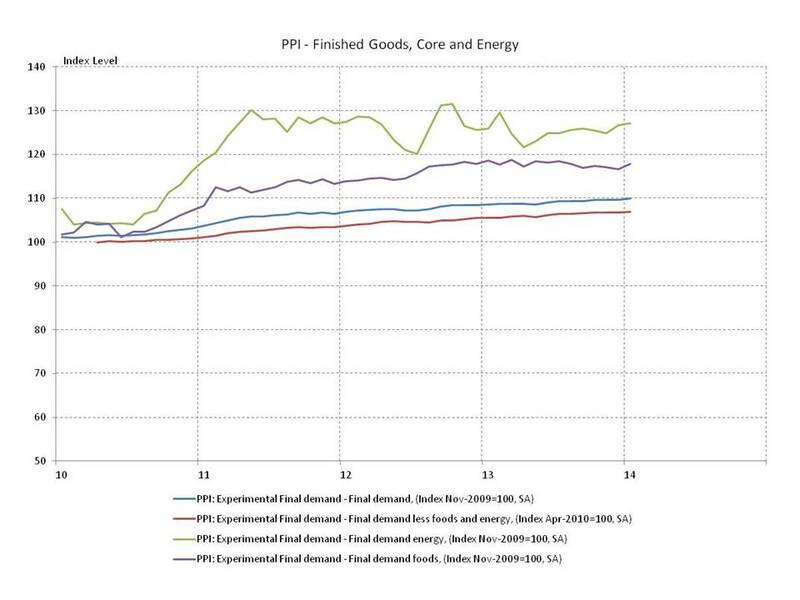 Producer prices for finished goods declined by 0.2% in October following a 0.1% decline in September. 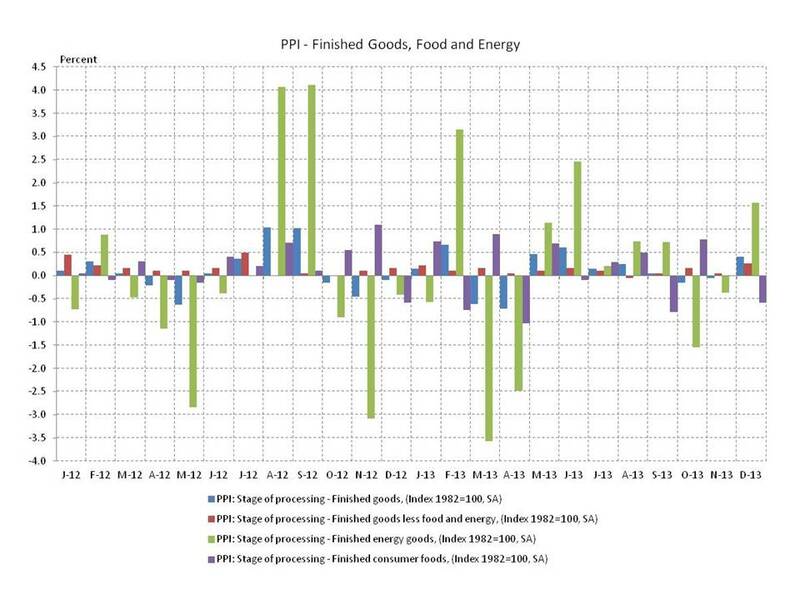 Increases in core prices (excluding food and energy) of 0.2% and food prices of 0.8% were offset by a 1.5% decline in energy prices, pushing the overall index down. Wood products prices edged up as the monthly PPIs are beginning to reflect increases in weekly measures. Gypsum prices declined modestly from a recent May peak but the outlook is for higher prices in 2014 given announced planned increases for 2014 from National Gypsum.